Who will fill the political vacuum in Tamil Nadu? M Karunanidhi, 94 was not just a five-time chief minister of Tamil Nadu, in South India, but much more. Who was this nonagenarian who left an indelible impression in South India, and for whom Tamil Nadu has shut down in mourning? Was he just an orator who could electrify his rank and file and sway voters? Or was he a scriptwriter whose dialogues not only launched cinematic careers for many stars but also sowed seeds of rebellion against social injustice? Was he a social reformer fighting against casteism and superstitions? A street fighter in anti-Hindi agitations, Karunandhi became a defender of Tamil pride, a champion of Dravidian nationalism and a strong advocate of federalism. A rare phenomenon that has no parallels in the history of modern India, Karunanidhi was known as ‘Kalainjar’ or ‘The Artiste’ who leaves a rich legacy. Born in Thiruvarur district of Tamil Nadu on June 3, 1924, he was the third child of Anjugam and Muthuvelar. Hailing from the Isai Vellalar caste of temple musicians, Karunanidhi who was christened as Dakshinamurthy was sent to learn the nadaswaram (a double-reed wind instrument) and mridangam (a percussion instrument). But the young boy rebelled as nadaswaram players were not allowed to wear a shirt or angavastram(stole worn by men) by the rigid Brahmanical system. Members of the community would also double up as barbers on special occasions. This sowed seeds of strong-anti-Brahmanism. Initiated into the Self-Respect Movement by none other than Erode Venkatappa Ramaswamy Naicker or Periyar, the founder of Dravidian Kazhagam, young Karunanidhi participated in the anti-Hindi agitation when Hindi was made compulsory by the then Indian National Congress, led by the C Rajagopalchari government in 1937-38. Based on the bedrock of this anti-Hindi agitation, MK grasped the fundamentals of Dravidian politics and later went on to shape its grammar. A talented writer, MK also brought out a handwritten newspaper called Manavar Nesan. He also wrote box-office-winning dialogues for films that launched the careers of legendary actors Sivaji Ganesan and MG Ramachandran (MGR). A class ten drop-out, he wrote his first movie script—Rajkumari—in 1944, with MGR in the lead role. 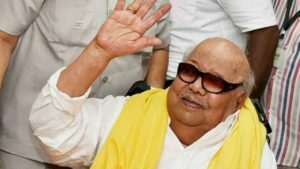 When C Annadurai fondly known as ‘Anna’ launched the Dravida Munnetra Kazhagam (DMK), Karunanidhi joined him and entered the Tamil Nadu Legislative Assembly from Tiruchi in 1957. Since then, MK has not lost a single election irrespective of the DMK’s electoral fortunes. When the DMK came to power in 1967, he was public works minister in Anna’s cabinet. After the sudden demise of his political mentor in 1969, he became the chief minister of the state for the first time, a feat he would go on to repeat four more times. MGR who had helped propagate the DMK’s ideology and its electoral symbol of the Rising Sun, quit the party after differences with Karunanidhi and launched the All India Anna Dravida Munnetra Kazhagam (AIADMK). In 1977, the AIADMK defeated DMK. Since then, both the DMK and AIADMK have taken turns to rule the state. As far as his political legacy is concerned, he set up a commission for backward classes in 1969. It also introduced the concept of free education for people belonging to certain castes and classes. Government jobs were reserved for women and several self-help groups set up for their progress. As a champion of a casteless society, he introduced the concept of ‘Samathuvapuram’ (Equality Villages)—villages of 100 houses each were created to accommodate the various castes, with one community hall and burial ground to be shared by all. The scheme was named after the social reformer, Periyar. Credit goes to MK, who along with arch political rivals MGR and later J Jayalalithaa as chief minister, ensured that Tamil Nadu remains one of the most progressive and industrialised states of India. Embroiled in multiple corruption scams, the biggest of them faced by DMK was perhaps the USD 4.7 billion telecom racket that roiled the Congress-led United Progressive Alliance (UPA) government that was voted out in 2014. The late patriarch’s government was dismissed twice, way back in 1976 and in 1991, by the Congress government which ruled at the Centre. He was an ardent advocate of strong federalism and state autonomy. He secured the right for chief ministers to hoist the national flag on Independence Day. Tamils all over the world can never ever forget his call for Eelam—a pristine homeland for the Tamils in northern Sri Lanka without stoking separatist sentiments in Tamil Nadu. Already Tamil Nadu is plunged into a political vacuum following the death of the former chief minister and his arch political rival, J Jayalalithaa in December 2016. Political observers will keenly watch how the family feud, especially between his sons’ MK Stalin-working president of DMK—and MK Azhagiri, whose stronghold is southern Tamil Nadu, will play out in the coming days. Azhagiri has been expelled for indiscipline. So the issue of succession in DMK is not fully settled. Meanwhile, popular film stars, Rajnikanth and Kamal Hasan, are waiting in the wings to fill the political vacuum in Tamil Nadu. MK’s characteristic attire was a simple white shirt and veshti (traditional Tamil formal wear), oversized dark glasses, and bright yellow shawl. When he addressed people, he would begin by saying: “En uyirinum melaana anbu udan pirappukkale” (my brethren, who I consider greater than my life) in chaste Tamil. One wonders whether Stalin or other politicians in Tamil Nadu can mimic those lines to get closer to the masses!